Senior Lecturer Department of Orthodontics and Dentofacial, Orthopaedics,Dayananda Sagar College of Dental Sciences, Bangalore.Karnataka, India. Professor, Department of Orthodontics and Dentofacial Orthopaedics, Yenepoya Dental College, Mangalore. Karnataka, India. Yenepoya Dental College, Mangalore. Karnataka, India. Rizwan, M., Mascarenhas,R., Husain, A. "A New Approach to Retention of Class II Sagittal Correction". Correction of any deviated sagittal skeletal pattern at the earliest age is a best remedy for young growing patients and a great challenge for clinicians. Having achieved the desired correction with any removable myofunctional appliance therapy, the biggest challenge now is to retain the achieved correction. So far, the passive phase of the Twin Block Therapy ends with the sequential trimming of the appliance till the permanent posteriors intercuspate into each other. Here is a new method to retain the sagittal Class II skeletal correction in a mixed dentition, where a combination of both Orthodontics and orthopaedics is employed. This method seemed quite acceptable and stable from the patients perspective, especially when orthodontic treatment succeeds orthopaedic correction. La corrección de cualquier patrón de esqueleto sagital desviado en la más temprana edad es la terapia indicada para los pacientes más jóvenes y un gran desafío para los médicos y Odontólogos. Habiendo alcanzado la corrección deseada con cualquier terapia de dispositivo Miofuncional extraíble, el mayor desafío es mantener la corrección obtenida. Hasta ahora, la fase pasiva de la terapia de Twin block termina con el recorte secuencial del dispositivo hasta que los dientes posteriores permanentes intercuspiden entre sí. Aquí presentamos un nuevo método para conservar la corrección esquelética sagital de clase II en una dentadura mixta, donde se emplea una combinación de ortodoncia y ortopedia. Es un método bastante aceptable y estable desde la perspectiva de los pacientes, especialmente cuando tratamiento de ortodoncia se efectúa correctamente y se requiere una corrección ortopédica. A number of appliances are available these days for the correction of unfavourable sagittal skeletal relationships. 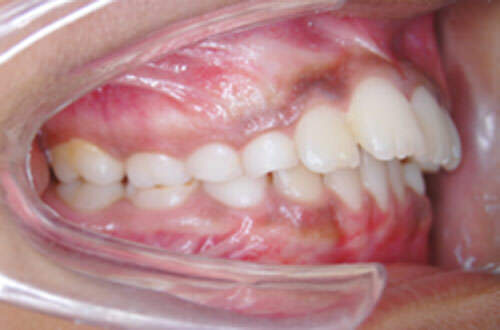 Here is a case of an 8 year old female patient who presented with mixed dentition, Class II dental and skeletal pattern, and mild crowding upper and lower anteriors. On Clinical and cephalometric examination maxilla appeared normal in length and size but the mandible was deficient mandibular length by 7 mm. Clinical examination showed that the VTO was positive. A two phase treatment was planned, in the first phase the sagittal correction was brought about followed by the second Phase where the dental corrections with fixed mechanotherapy were carried out. 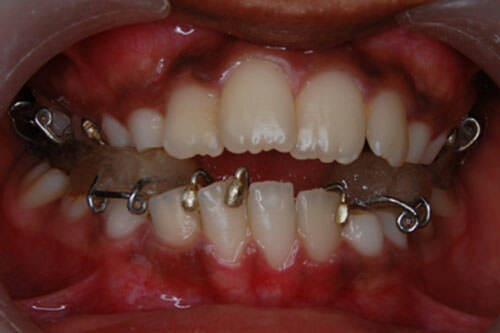 Phase one correction was achieved using, removable Twin Block Appliance Therapy, the active therapy extended to 8 months followed by 6 months of support phase during which time the appliance was selectively trimmed and finally the retention of the achieved correction was carried out for another 6 months with the same appliance. Having achieved the sagittal correction, dental corrections were initiated. Overcorrected sagittal relation (Prior to dental correction). Phase two, dental corrections were initiated with 2x4 Pre-adjusted edgewise appliance (since the patient was in mixed dentition). A custom formed 0.016" AJ Wilcock stainless steel with cuspid circles was the arch wire of choice along light force Class II elastics. Class II elastics engaged from the upper cuspid circles to the lower molar tube hooks for retention of the Class II sagittal correction. At the end of the retention phase of the Twin Block therapy, sagittal correction with an improvement in profile was appreciable, but a satisfactory inter cuspation of molars did not exist, this was due to the slight sagittal over correction. Fearing a relapse, long term retention had to be planned throughout phase two or at least till a good inter cuspation of molars was established. The custom formed 0.016" AJ Wilcock stainless steel arch wire with cuspid circles was flexible in relieving crowding and rigid enough to prevent deflection of the arch wire or arch form under the influence of light force Class II elastics. Within two months crowding was relieved and at the same time light force Class II elastics which were engaged from the upper cuspid circles to the lower molar tube hooks retained the achieved sagittal correction. 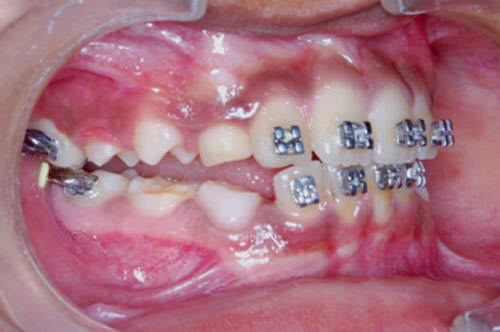 We intend to continue with this technique till a tight intercuspation is established or until all the permanent teeth erupt, after which active orthodontic therapy would commence. The key to the success of this treatment, was the extra ordinary cooperation of this young patient throughout both phases of the treatment. This simple but yet an efficient technique proved clinically applicable to all such cases where dental correction followed sagittal correction, especially in mixed dentition cases. 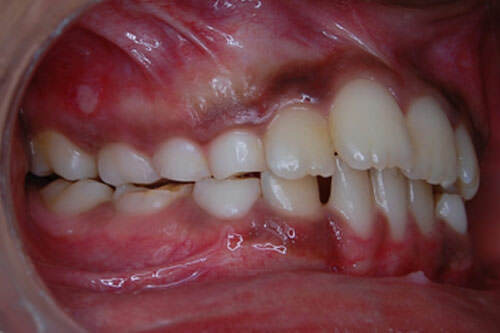 This retention technique can be actively employed until all permanent teeth erupt or atleast till the first permanent molars make a thorough intercuspation. McNamara Jr, J.A and Carlsan D.S - Quantitative analysis of Temperomandibular Joint adaptations to protrusive functions. Am. J. Orthod.1979 (76) 593-611. Pertovic A, Stutzmann J, Gasson N - The final length of the mandible: Is it genetically determined? In Carlson D.S, ed, Craniofacial Biology. Ann Arbor: Monograph 10, Craniofacial Growth Series, Centre for Human growth and Development. The University of Michigan, 1981. 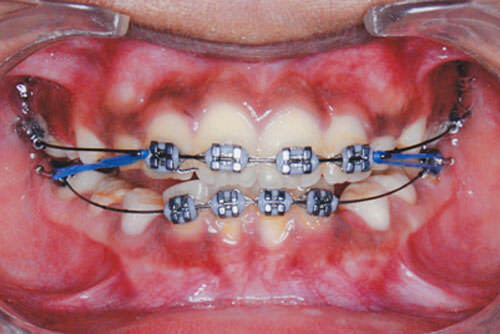 McNamara Jr, J.A and Bryan F.A- Long term mandibular adaptations to protrusive function. An experimental study in Macaca Melatta. Am. J. Orthod and Dentofac Orthop.1981 (92) 98-100. Clark W.J - The Twin Block Technique. Am. J. Orthod and Dentofac Orthop.1988 (93) 1-18. Isaacson R.J, Lindauer S.J, Rubenstein L.K - Activating a 2x4 appliance. Angle Orthod. 1993(63) 17-24. Stangl D.A - Cephalometric analysis of six Twin Block patients, A study of mandibular (Body and Ramus) Growth and development. Funct Orthod 1997(14):4:6,8,14,17-19,21-22,24-25. Baccetti T, Franchi L, Toth L.R, McNamara Jr, J.A - Treatment timing for Twin Block Therapy. Am. J. Orthod and Dentofac Orthop.2000 (118) 159-170. Clark W.J - Twin Block functional therapy, 2nd ed. Mosby. 2002.